Moments after we were married. Very happy. As I briefly explained last time in this post, I got married a couple of months ago. Although we still have many photos to grab off friends and family, we have a few photos and we also have the professional ones that have come in from our amazing photographer. So this post will focus more on our own photos (so far), while the next one will include some of the photos from our shoot in the forest (which, without blowing my own trumpet, looked a bit magical). When we get the other photos, there may be a part three to this (but that is a maybe). Our wedding was an odd one from the start. We decided to get married just a few months before, and the wedding planning was done in one night about two weeks before the big day itself. 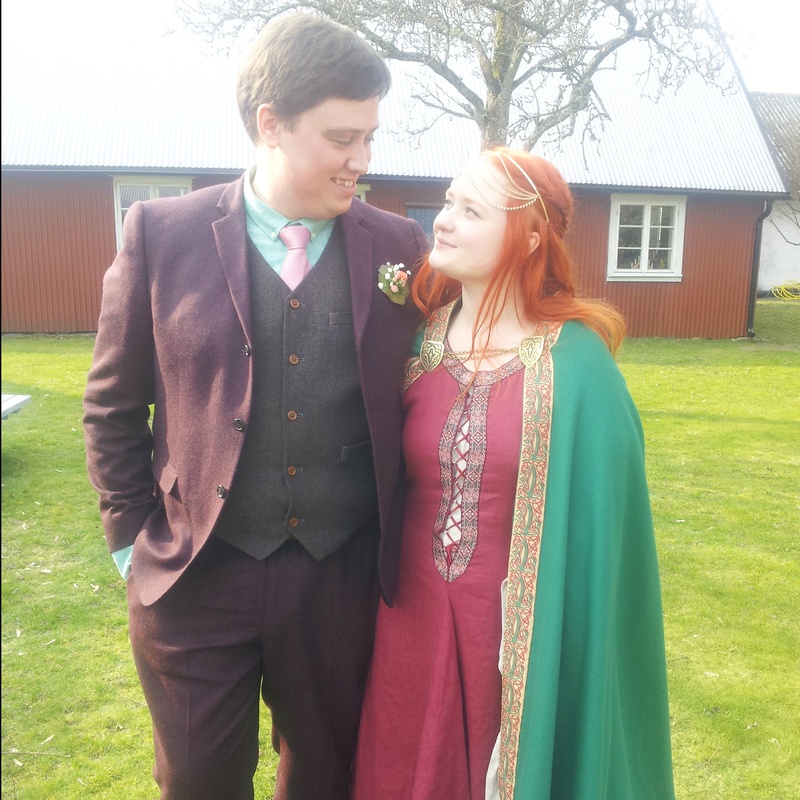 We decided to have a small wedding of about 30 people, and a few months earlier we bought our rings and our clothes, perhaps the most expensive parts of the whole thing. 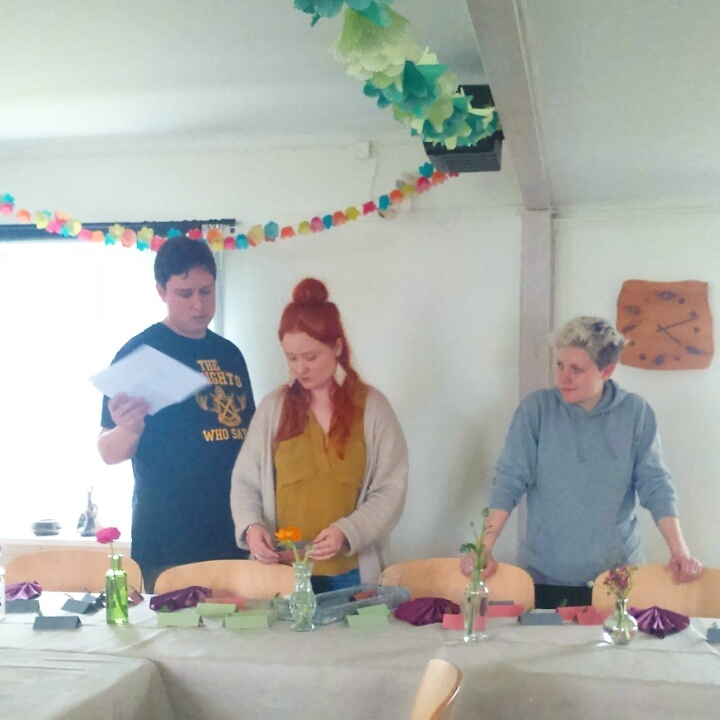 To bring the cost down, and also to have greater control of our own wedding, we decided to do everything ourselves. Linnéa was in charge of the decorations, I was in charge of the food, together we worked on the music, guests and seating arrangements. We were surprisingly calm. Her cousin looks concerned, she herself looks in control, I look more baffled than I am. Yes, I am wearing a Monty Python t-shirt. You can see some of the moss there – my memory tells me there was a lot more added in the end. The tables were very full on the day, at any rate. other things and shot off with her dad to fix the problem, but then ended up through no fault of her own taking three hours. Luckily, we had other family members and friends with us (nearly half the wedding was there helping the day before, phew) and so she directed the decorations over the phone until her return, and by dinner time we were done and heading off to spend the evening with friends in a jacuzzi and sauna right by the sea. The decorations she mostly made by hand, and we took moss fresh from the forest to place over the tables to add an earthy and intimate feel to the whole affair (sadly, I am lacking photos of us all sitting at the table on the big day…I will try and find some). Our rings. 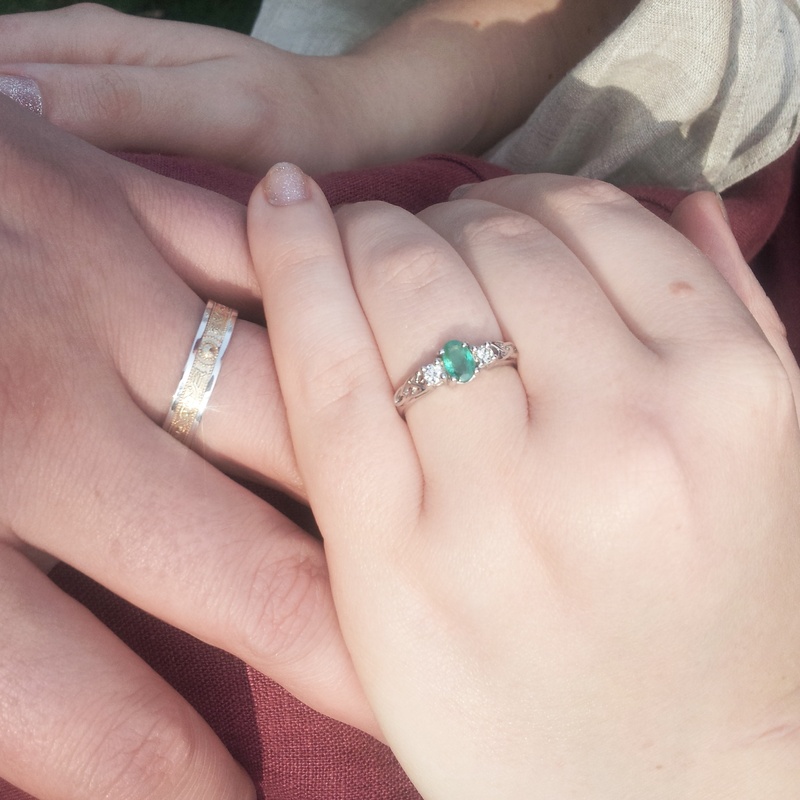 We have a better professional photo for the next post – her ring is emerald and Celtic, mine is a Celtic gold and silver ring that is hard to see in the sunlight. The big day itself went fairly according to plan. For a start, the weather came through for us – 17 degrees C (63 F) and sunny in early Spring is a rare thing indeed (and was followed by a week of rain and 5C/41F) so we were very lucky there – it’s just reaching those temperatures again now. We ignored convention (we ignored a lot of conventions, to be fair) and I was with her while her hair and make up was done (so she didn’t panic). We then went to the forest to take our professional photos before the ceremony or the reception – the ceremony was in a little courtyard right outside the reception, so it felt silly to do it in between. We were fashionably late (we lost track of time in the forest), but then we rounded everybody up outside and got on with the ceremony. After only a couple of minutes, we were married – luckily we asked Linnéa’s uncle to give a speech to help flesh out the ceremony somewhat, and he did an amazing job (and we have a great video of it too). After a mingle outside for an hour or two (and myself popping into the kitchen to see how my amazing helpers were going with my confusing instructions and half cooked food – they’re Italian so it was fine) we went inside for the dinner. Us at the dinner, towards the end actually. As the night went on we shed our layers – she had a cape on top of a dress on top of another dress. 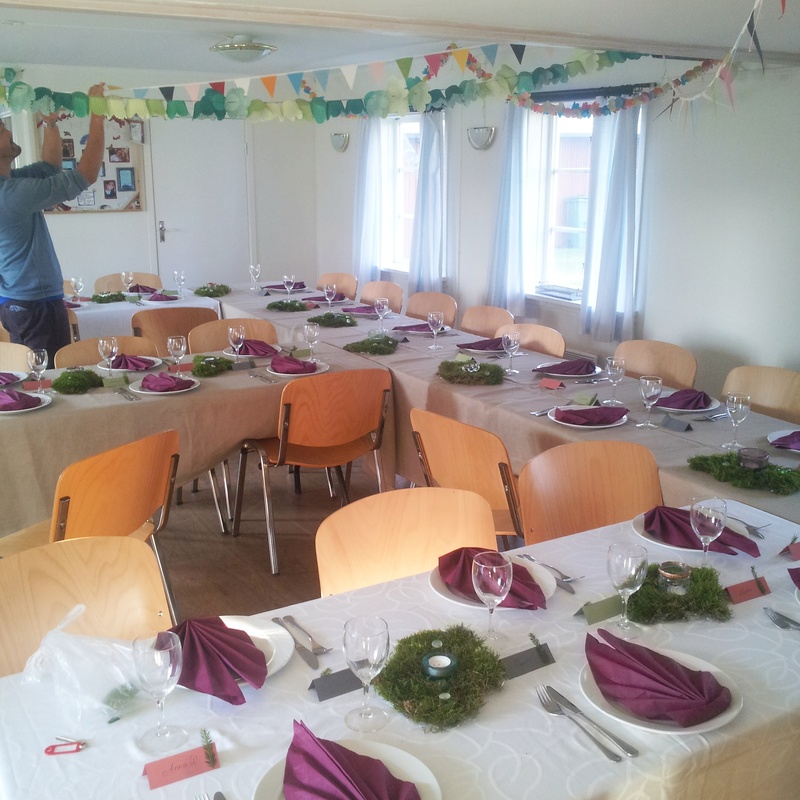 The dinner went well – my food was different and memorable like I hoped (stupid me forgot to take photos though), and Linnéa’s decorations achieved their aim and made the whole thing really cosy (and they looked fantastic). Her grandfather gave a speech in Swedish (and gave us the script for her to translate for me), her dad gave a speech in English and then I got up and gave something that amounted vaguely to a speech (apparently my Aussie friends were impressed at how short I kept the speech…I have a habit of waffling on, as I am sure long-time readers of this here blog have observed). Her best friend and cousin got up with another friend to sing one of “our” songs – “Sew My Name” by Josh Pyke (go look it up, it’s amazing). We played a couple of games to show how much we knew each other (which were surprising for many people but not for us). 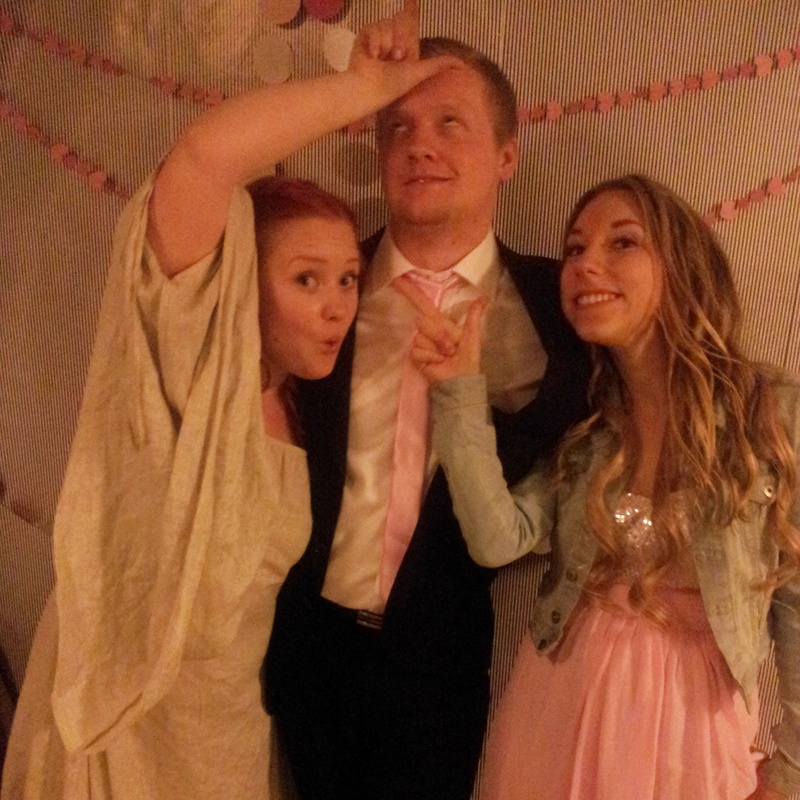 Linnéa, her brother and her brother’s girlfriend. We set up a photo booth of sorts and forgot to tell people about it until the end, so there’s a lot of very sweaty photos of us all after we had been dancing. These guys manage to look a lot fresher than I did in most photos by that time of night. After all of this, we got up and danced until midnight. Which was something unusual for me – in Australia, weddings often finish dinner around 9pm, there’s a bit of dancing for an hour or so and by about 10:30, 11pm the wedding ends. 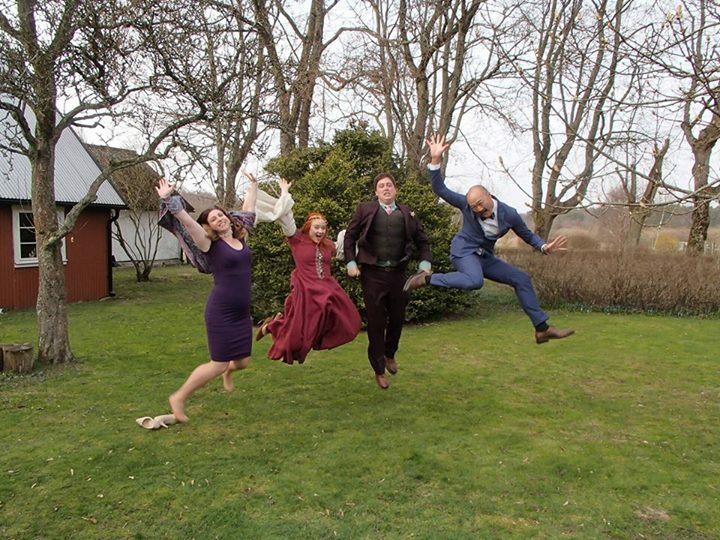 Here in Sweden, only having three hours of dancing and our wedding finishing at midnight makes it an “early night” – I’ve already been to one other wedding here that went until the wee hours of the morning. It’s a funny thing in itself – the Swedes are so shy and introverted, and Australians on the whole are very extroverted and renowned for their friendliness and willingness to talk to strangers (it’s no myth, I’ll tell you). 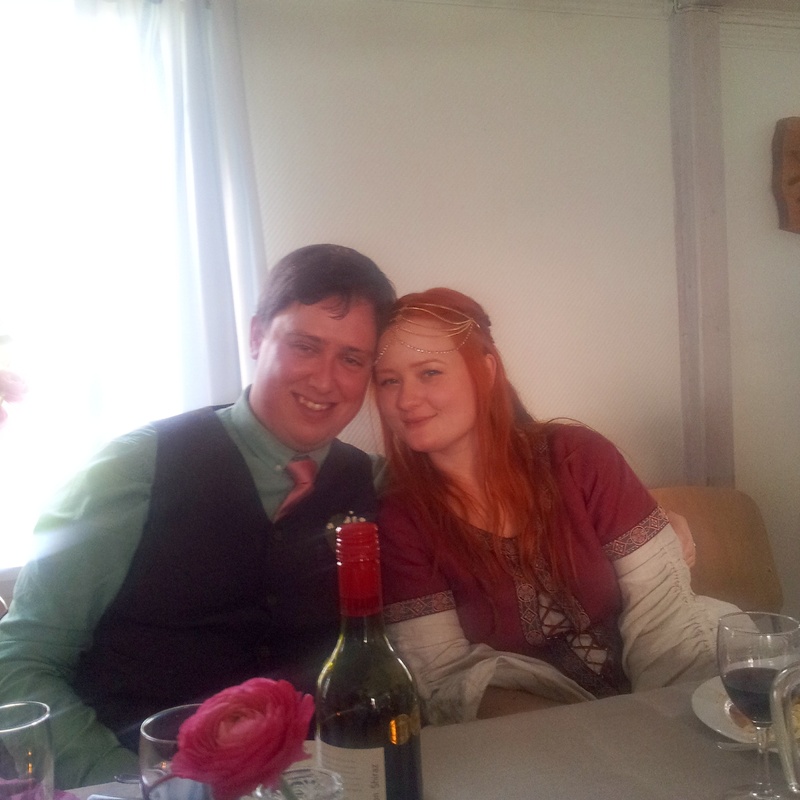 So it’s odd that in Australia weddings seem so restrained, yet in Sweden they let loose – but that’s the way it goes I guess. Every culture has its little oddities. We had my friends from Australia with us for a few more days, and within three weeks we were on a plane to Australia to meet my side of the family and attend my sister’s wedding…but that’s another post or two down the track (at least two more posts will come from those photos). To finish off for now, one of my favourite photos taken on my Aussie friend Jimmy’s phone (he’s the crazy one on the right, and Sarah, my other friend from down under, is on the far left).